Randall Beiler will sacrifice anything to take care of his younger siblings and the family farm, even if it means forsaking love. But when his brother offers pretty Elizabeth Nolt a job cleaning and cooking for the family, Randall is furious—and feels guilty about the way he once broke Elizabeth's heart. Then he learns that Elizabeth and her grandmother are struggling to make ends meet and he knows the offer, no matter how painful, is the right thing for everyone. Elizabeth wants to refuse but she needs the work. Though she vows to protect her heart, spending time in the Beiler household makes Elizabeth realize that her love for Randall still burns strong. And though Randall keeps his distance at first, time and teamwork reveal that something deeper still connects them. Elizabeth isn't sure what to think: Does Randall want her because he truly loves her, or because he needs a housekeeper? And if his feelings have changed for sure, Randall must find a way to show Elizabeth what she really means to him or risk losing his partner in life and love forever. Additional notes: This is the third book in the Return to Sugarcreek series. You can read my review of the first book here and my review of the second book here. 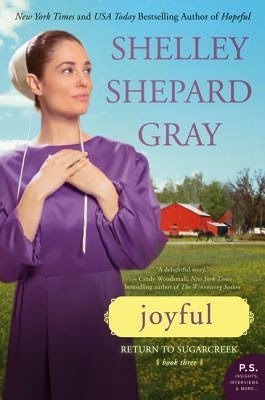 My thoughts: There is something warm and simple about reading an Amish fiction book and getting back to the roots of faith: loving and trusting God. It's not always easy or fun, but it brings such peace to my heart, and peace is just what some of these characters are seeking. I have to say amidst all of the different plot points within the series, the plot point involving Judith and Ben is my favorite. They are fostering a little boy and have fallen deeply in love with him. Their story is fully resolved in this book, and while it was heartbreakingly sad, it was also happy... and well, joyful. It was fun and rewarding to delve deeper into the Beiler household. My curiosity was piqued in book 1 of this series for this family, so it was great to be able to spend time with the family. There will be a Christmas book for this series coming out later this year and I sincerely hope that series involves this family as well... I'm anxious to see where the brothers' stories end!